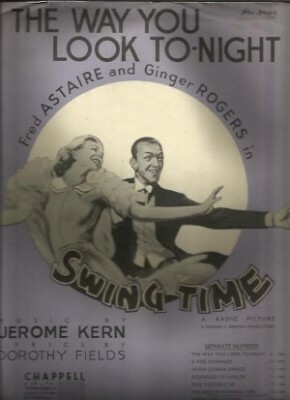 “The Way You Look Tonight” was introduced by Fred Astaire in the 1936 film Swing Times; the song won the Academy Award for Best Original Song for the year. Dorothy Fields remarked “The first time Jerry played that melody for me I went out and started to cry. The release absolutely killed me. I couldn’t stop, it was so beautiful.” Dorothy Fields was the first woman to win an Oscar for songwriting. It’s a magnificent love song that has found a strong position as a jazz standard, with recordings by Bing Crosby, Billie Holiday, Mel Tormé and Frank Sinatra. “The Way You Look Tonight” was recorded on April 7, 1958 and released in 1958 on the album Long Ago and Far Away. It was arranged by Frank DeVol. “The Way You Look Tonight” was recorded on ca. 1997 with the Ralph Sharon Trio for the film My Best Friend’s Wedding, released in 1997. “The Way You Look Tonight” with Faith Hill was recorded in 2011 and was released that year on Duets II. “The Way You Look Tonight” was recorded in 2012 with Thalia and released on Viva Duets. “The Way You Look Tonight” was recorded in 2012 with Thalia, with just a guitar accompaniment. This arrangement was released on the deluxe version of Viva Duets.